18 cm front to back. 14 cm tall. 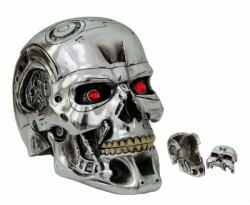 Official Terminator skull box. Nemesis Now licensed Terminator products. It's not obvious that the 1kg skull comes apart so a great place to store valuables. Closes with magnets.